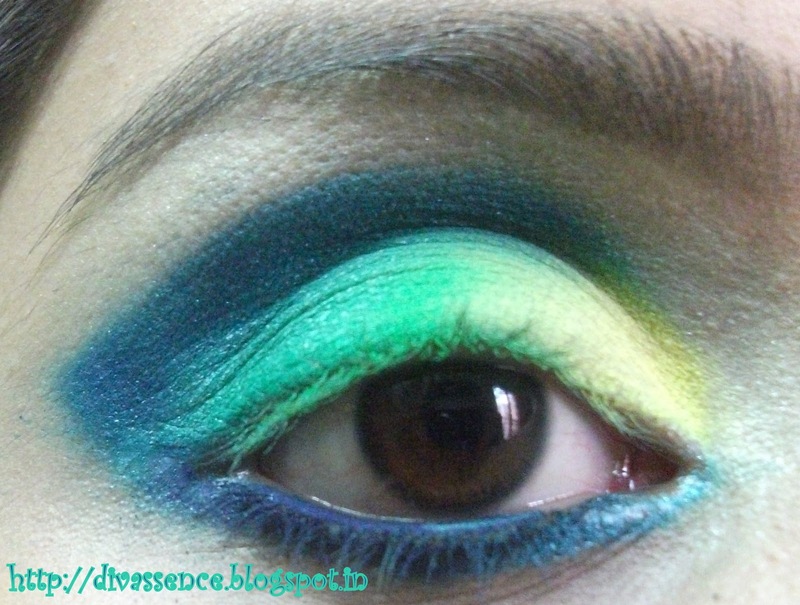 Blue & Yellow Macaw Inspired Bright Eyemakeup Tutorial - Divassence! 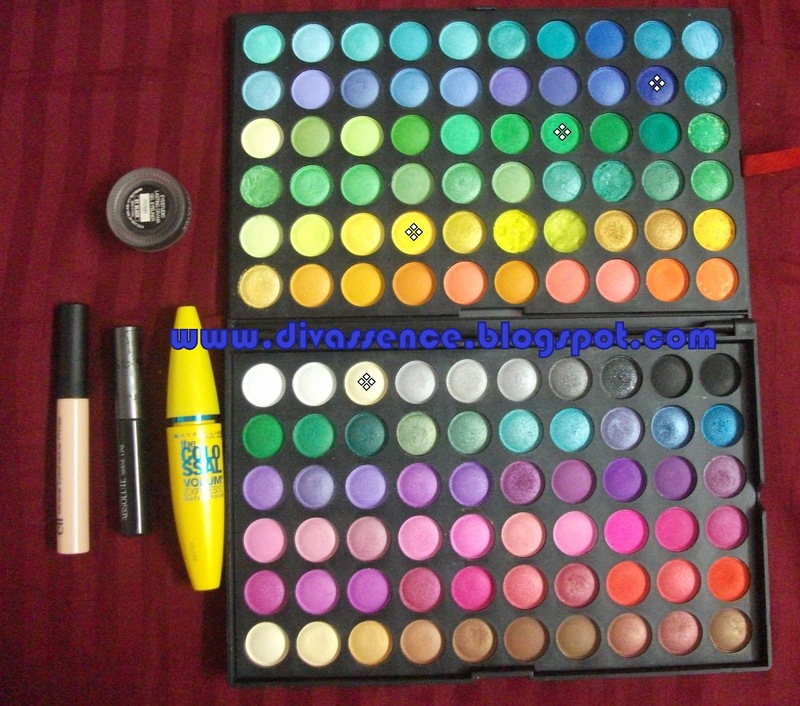 I finally received my 120 eyeshadow palette from Buyincoins. 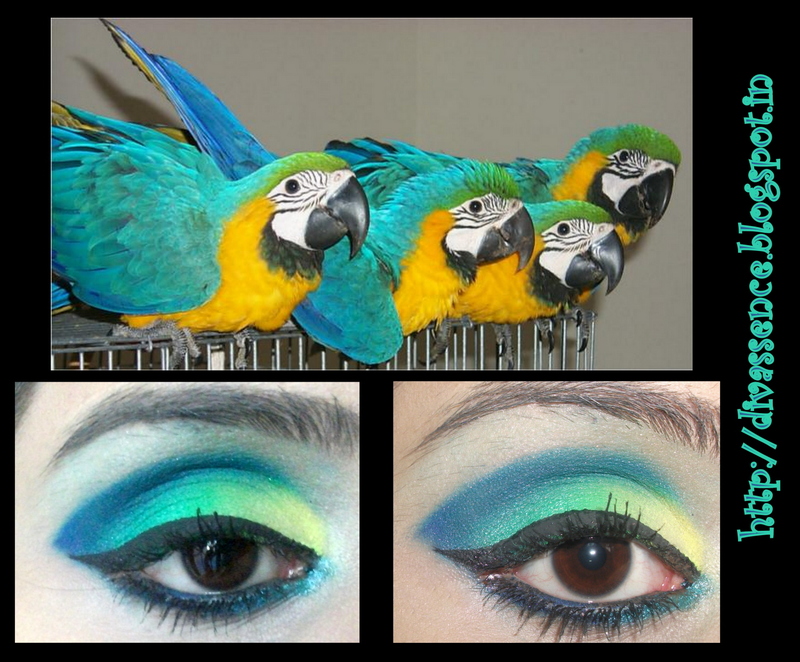 :woot: :woot: This is going to be my first look with the palette & I wanted to do a bright colorful look so I took my inspiration from the Blue & Yellow(or is it blue & gold) Macaw. They somehow fascinated me more than the Scarlet Macaws. 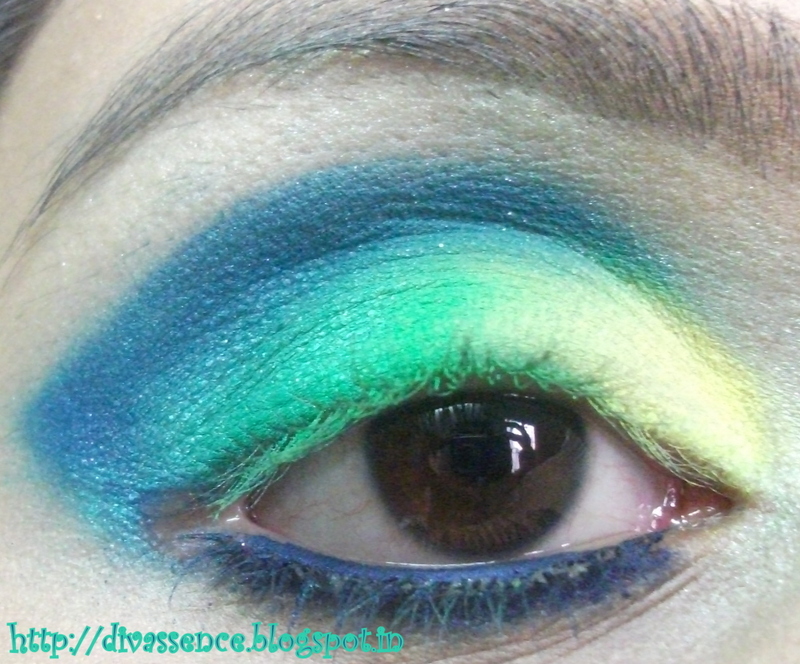 Also they showcase all the colours I wanted to try-yellow, green., teal & blue. Step 1: Prep and prime your eyes. 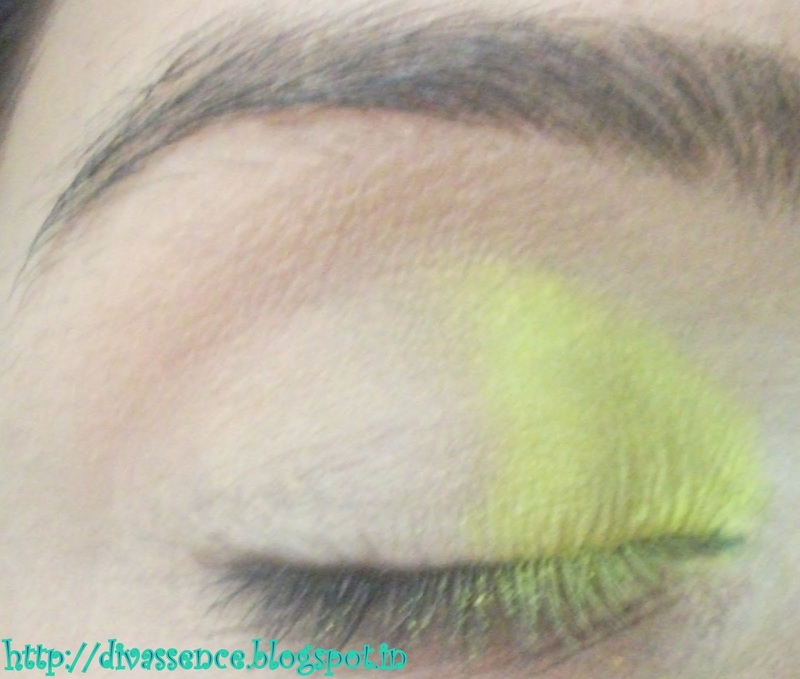 Step 2: Apply a yellow eyeshadow to 1/3rd of your eyelid. 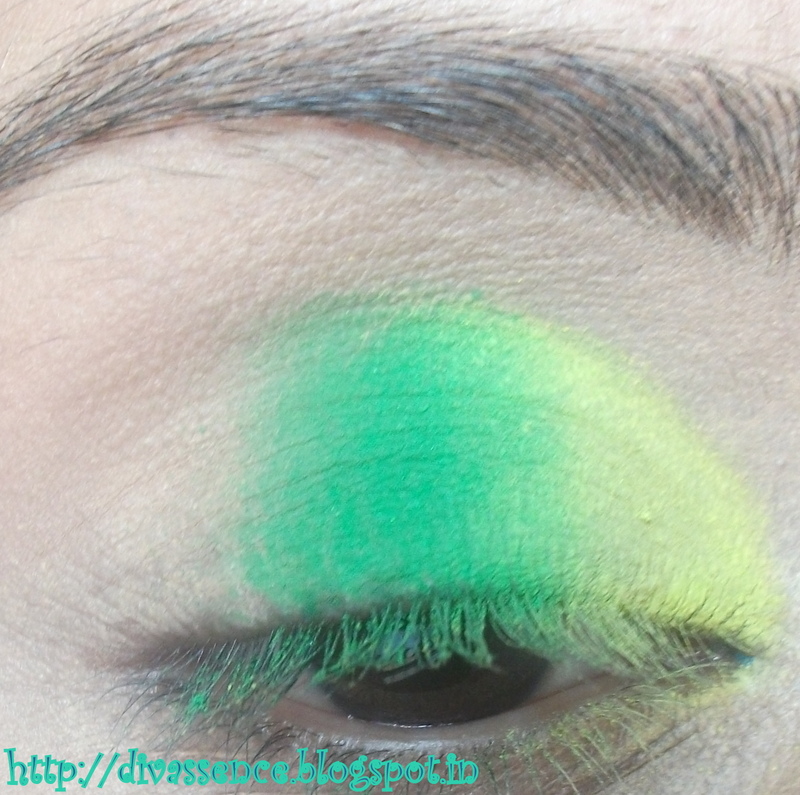 Step 3: Next, pat a bright parrot green eyeshadow next to the yellow eyeshadow. 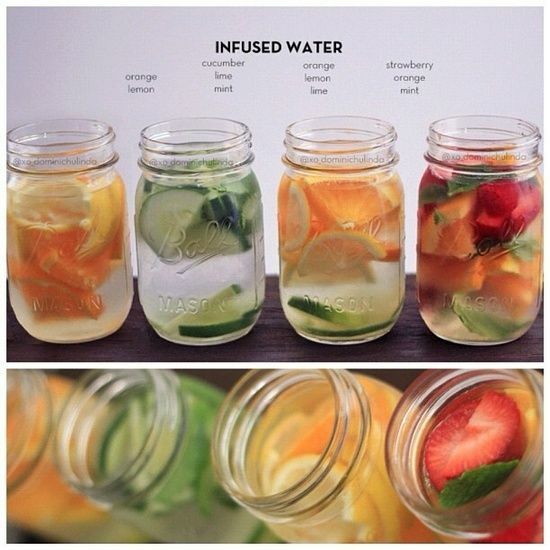 You don’t need to blend them yet as we’ll be doing that in the end. 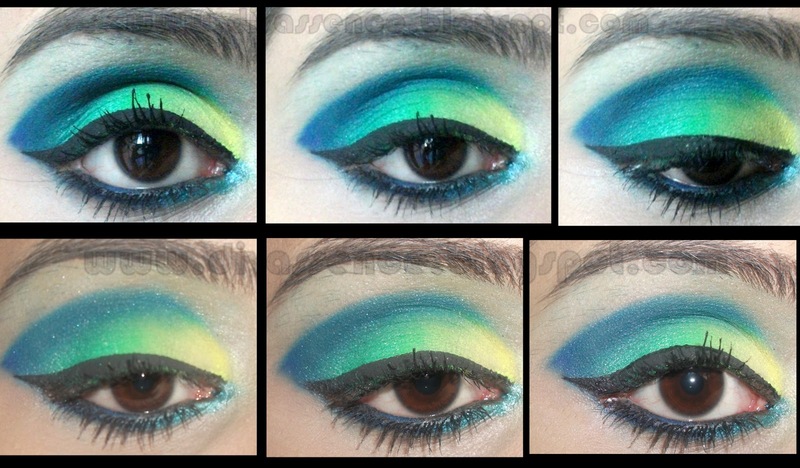 Step 4: Take a teal color eyeshadow & apply it to the outer 1/3rd of your eyelid. 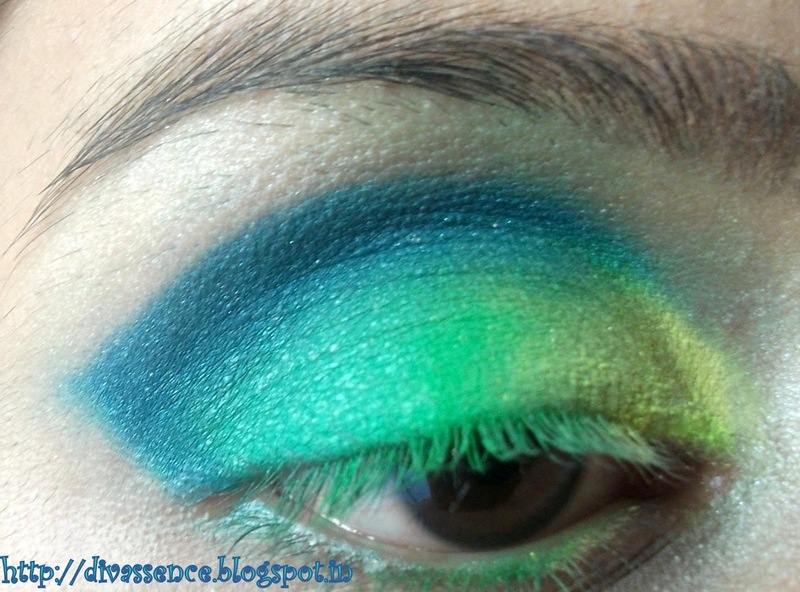 Step 5: Next, apply a royal blue eyeshadow in your crease & blend it lightly in the v shape. I don’t like blending it towards the brow bone,however that is entirely upto your choice. 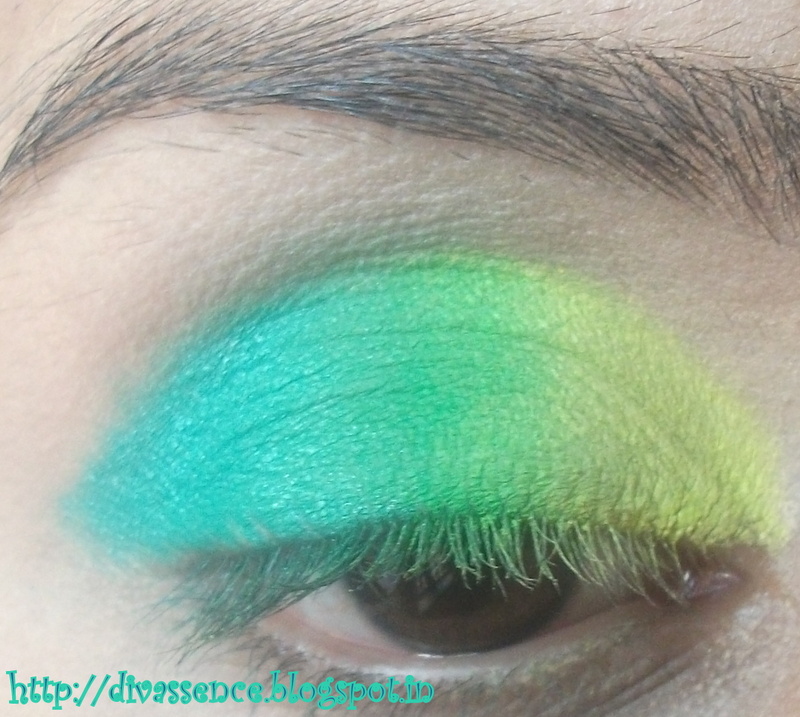 Also,lightly blend the other 3 eyeshadows together ie- yellow, green & teal. 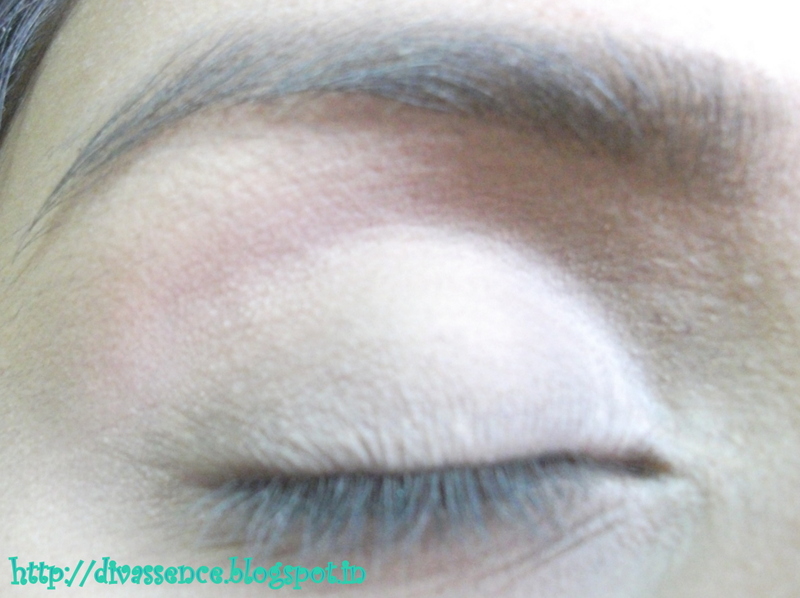 Step 6: Apply a highlighter one shade lighter than your skin tone to your brow bone. Step 7: Apply a navy blue colored pencil or E/S on the 2/3rd of your outer lower lash line(leaving 1/3rd of the inner corner) as well as waterline. As I had removed my earlier eye makeup with baby oil I wasn’t able to apply the pencil on my lower outer corner. Sorry! 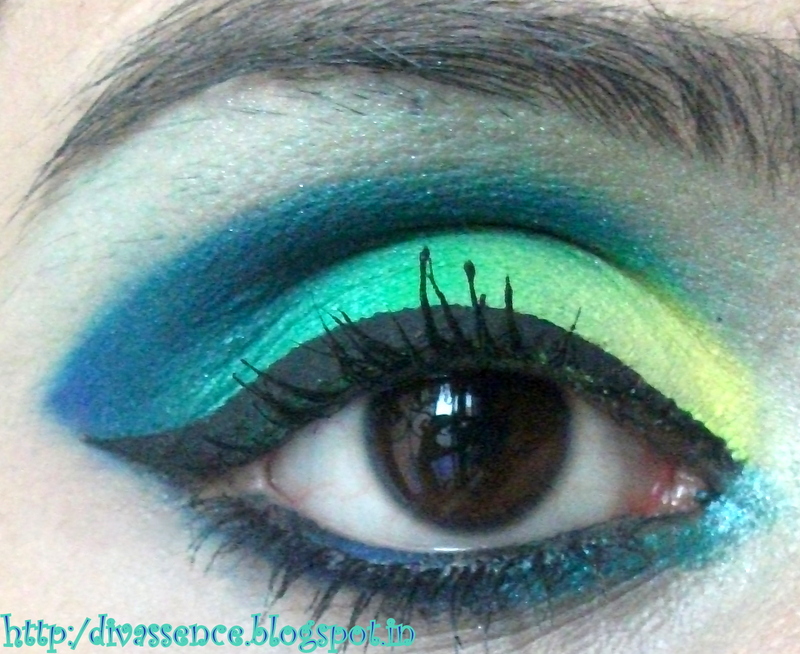 Step 8: Take a teal or a peacock blue shade pencil & apply it on the inner corner of your lower lash line. Step 9: Apply a thick winged liner, tightline your eyes(if you didnt apply the colored pencils on your waterline) & apply atleast 2 coats of mascara. Now this is where I kinda ruined the look. My highlighter wasn’t showing up in the pics so I touched it up without cleaning the brush of the teal E/S residue.I had been on my feet for 3 hrs straight,no it doesn’t take THAT long to create this look but I take almost 300-400 pics for a single tutorial so it all adds up & I was too tired to remove it & apply it again..Sorry!!! superb job ! its so stunning ! 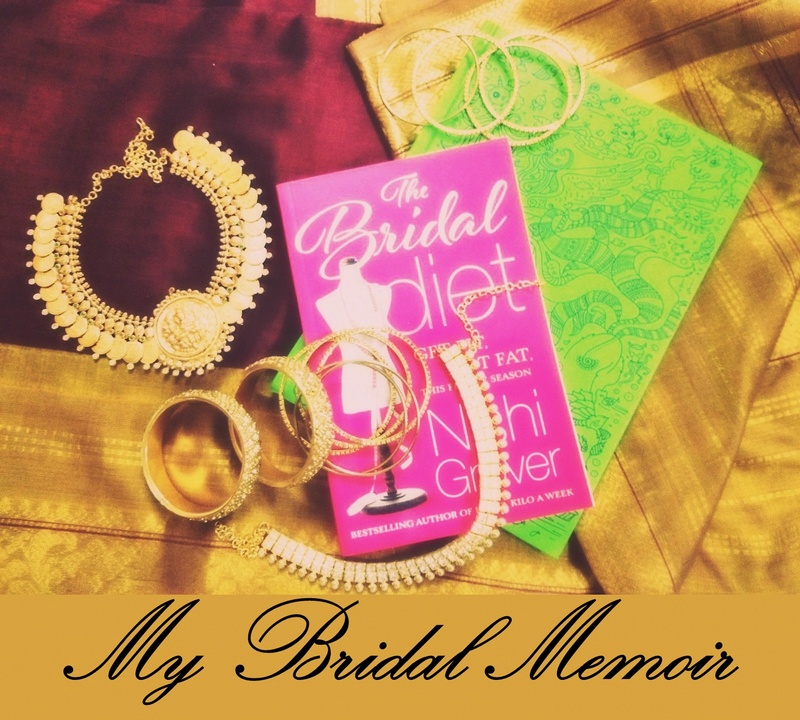 loved it ! superrr baby..loved the play of colors. you rock! Oh myyy myyy… amazing.. vibrant colors.. amazing blending..
the colors r so beautifull and i really loved it..
Also i love the way you have lined you eyes. gorgeous!! I know what you are talking about girl when you say 200-300 photos. taking pictures of your eyes is insane-i can empathize with you! I recently started doing eye looks and I have had some 3 posts up and I’m already running out of enthusiasm! 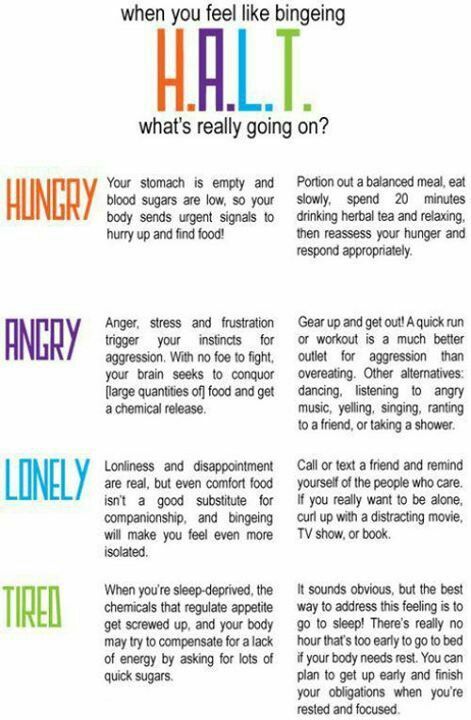 Great idea and superb execution!